It’s not always easy to tell, but Rattus rattus there is distinct from the little friends one generally sees in the United States; those are R. norvegicus, the Norway rat, which is from Asia and not Norway at all. If you do see R. rattus in the States, you’re probably down South, where they are often called tree rats or roof rats because of their fondness for climbing high off the ground. (Norways like to stay down low.) How do you know which murid you’re looking at? 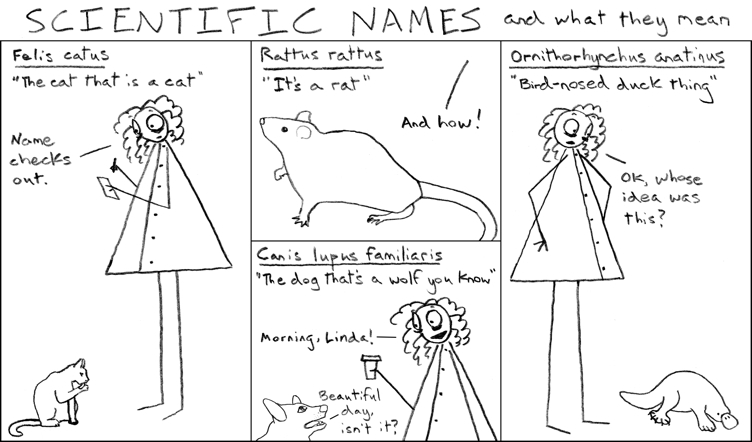 Well, if it helps, R. rattus looks like a big mouse: it has a pointier muzzle and larger eyes and ears than its cousin R. norvegicus. It also has a thinner tail that’s longer than its body, whereas the Norway’s tail is shorter than its body. Their droppings are also different shapes but I’ll spare you.